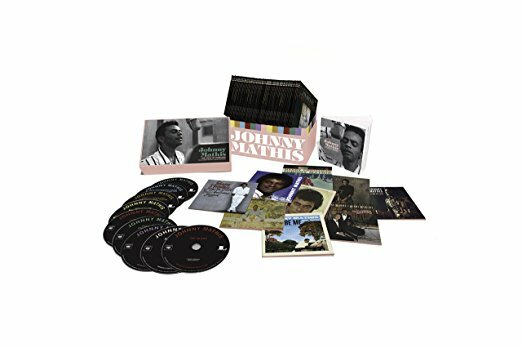 Sony Legacy has released a number of Johnny Mathis compilations over the past decade, including The Complete Global Albums Collection in 2014 and The Singles for his 80th birthday the following year. But if you’re interested in a complete career retrospective with plenty of tempting bonus material and you have a large budget, look no further than this year’s mega box set, The Voice of Romance: The Columbia Original Album Collection. Weighing in at 68 CDs and currently listed for $428, this set features 62 of the singer’s albums, including 25 albums that have never been released on CD in the U.S.
Also included are 40 previously unreleased songs and two never-before-heard LPs: the unreleased I Love My Lady recorded in 1981 with Chic’s Nile Rodgers and Bernard Edwards, and The Island, a 1989 collaboration with Sergio Mendes. Mathis, who has been recording for Columbia since his self-titled 1956 debut, assisted with the curation of The Voice of Romance, which concludes with his most recent album, Johnny Mathis Sings the Great New American Songbook.